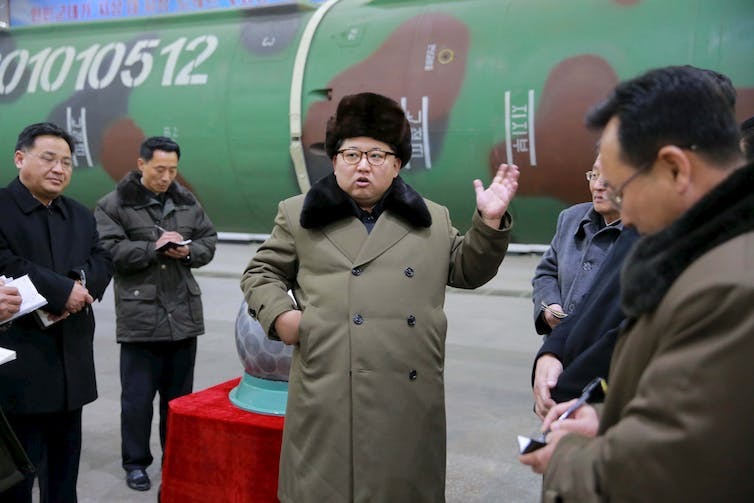 In North Korea’s eyes, its nuclear program is the only guarantee of regime survival. Over the weekend, more than 120 countries adopted a treaty at a UN conference that prohibits the production, stockpiling, use or threatened use of nuclear weapons or other nuclear explosive devices. Australia was a notable absentee. So were the nine countries that possess nuclear weapons. 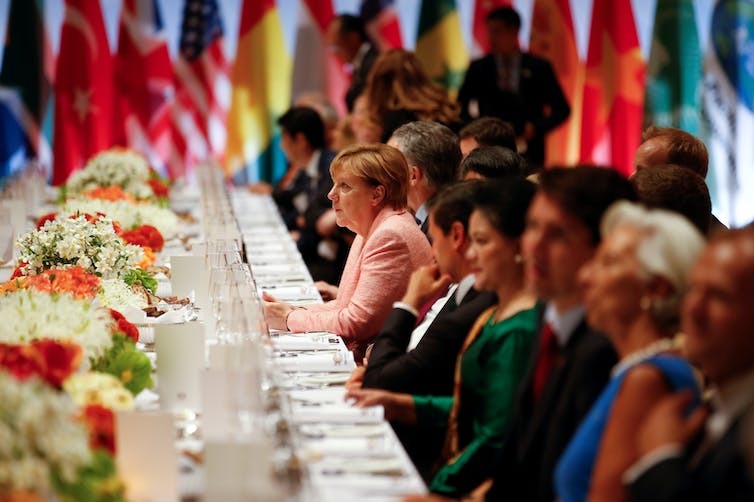 While the UN conference was taking a major step toward the elimination of nuclear weapons, the US and its allies – notably Japan, South Korea and Australia – were hoping to use the G20 summit in Hamburg to focus attention on the danger North Korea’s nuclear ambitions pose. However, the declaration issued at the end of the G20 does not even mention the issue. We can now expect a UN Security Council resolution that condemns North Korea’s latest missile test and applies slightly tougher sanctions. The glaring contradiction between the boycott of the nuclear ban negotiations and the preoccupation with the North Korean nuclear threat does not seem to have dawned on the US and its allies. North Korea’s apparently successful intercontinental ballistic missile test last week is widely seen, and portrayed by the regime itself, as part of a relentless drive to develop a reliable long-range nuclear weapon capable of striking the US. The US responded to the latest test by declaring the policy of “strategic patience” is now over. In a speech delivered in Poland prior to the G20, US President Donald Trump warned he is considering “some pretty severe things” in response to North Korea’s “very, very bad behaviour”. Donald Trump’s pre-G20 speech in Warsaw. Yet America’s options are limited. In the first five months of his presidency, Trump’s strategy was to cajole China into taking a more confrontational stance with North Korea. But there are limits to what China is able or prepared to do. Trump then intimated the use of tougher sanctions against North Korea, possible financial or trade sanctions against China for failing to do more, and even the direct use of military force. However, resorting to these coercive tools is unlikely to have the desired result. History tells us harsh economic sanctions are often counter-productive. They impoverish economies, strengthen dictatorships, and drive dissent underground. As for a military strike on North Korea, it could well lead the regime’s leader, Kim Jong-un, to launch a devastating strike against America’s allies, – notably Japan and South Korea. This might include the use of chemical, biological and possibly nuclear weapons. Such a turn of events may even drag China into the conflict. More promising is the policy of strategic caution advocated by Russian President Vladimir Putin and his Chinese counterpart Xi Jinping, which they reiterated in their separate meetings with Trump on the sidelines of the G20 summit. Both Russia and China argue North Korea can be persuaded to halt nuclear and missile tests if, in return, the US and South Korea suspend their joint military exercises. This would be a prelude to the resumption of talks involving the US and North Korea that could lead to undertakings for all sides to refrain from the use of force or other aggressive measures. This more pragmatic stance is close to the position of South Korean President Moon Jae-in, who argued in Hamburg that the focus should be kept on further sanctions and dialogue. Nothing said at the G20 summit will resolve the North Korean crisis, for it is but a symptom of a deeper ailment. The US and Russia, which between them account for 92% of the world’s nuclear weapons, are clearly intent on preserving and modernising their nuclear arsenals. They and other nuclear-armed countries have steadfastly resisted repeated calls for nuclear disarmament – even though Article 6 of the Nuclear Non-Proliferation Treaty requires them to do just that. The nuclear weapons treaty that has just emerged is a direct response to the morally and legally culpable inaction of the nuclear-armed countries – something the G20 summit did not and could not do. … human survival, the environment, socioeconomic development, the global economy, food security and the health of current and future generations. The treaty’s provisions are robust and thorough. In addition to prohibiting production, possession and deployment, each party to it undertakes never to test, transfer or receive from any recipient any nuclear weapons or explosive devices, and never to assist anyone or receive assistance from anyone to engage in any such activity. Countries are further prohibited from ever allowing nuclear weapons or other nuclear explosive devices to be stationed, installed, deployed or tested in their territory, or anywhere under their jurisdiction or control. But there’s more to the treaty than this. It specifically acknowledges the unacceptable suffering and harm caused to the victims by nuclear weapons, as well as of those affected by the testing of nuclear weapons, in particular indigenous peoples. The treaty also reinforces the legal obligation of relevant countries to provide appropriate remedies to the victims of nuclear testing, and effective repair of environmental damage. Those who have been busy drafting and redrafting the treaty have taken great care to make room at a future date for those countries that have not participated in the negotiations – in particular nuclear-armed countries and their allies. A well-crafted set of procedures allows for the progressive, transparent and carefully verified dismantling of their nuclear activities. Nothing said at the G20 summit will resolve the North Korean crisis. The dramatic events of the last week raise troubling questions for the future direction of Australian foreign policy. Why is it that Australia has been absent from the negotiations leading up to the adoption of this treaty? More than that, why has it done all in its power to thwart the initiative? The reasons are not hard to find. There is within Australia a firmly entrenched but dangerous mindset that America’s military might, including its nuclear arsenal, underwrites Australia’s national security. The Australian government’s opposition to the nuclear ban treaty is the logical consequence of its subservience to US strategic objectives and priorities. It is the extension of longstanding policies that have led Australia to entanglement in protracted, costly and unwinnable wars – in Korea, Vietnam, Afghanistan, Iraq and now Syria. It is the result of Australia’s psychological insecurity, and the tendency of governments to try to demonstrate at every opportunity that we remain America’s most faithful ally. Yet there are other options. Australia has much to gain from actively supporting efforts to prohibit and eliminate nuclear weapons, and from collaborating with like-minded countries and international organisations to develop an effective long-term nuclear disarmament agenda. Such a process would create immense possibilities for easing tensions in the Asia-Pacific region – not just in the Korean peninsula, but in China-US and China-Japan relations, and in the South China Sea. Public support for such a transition is greater than many would think. The nuclear ban treaty is the beginning, not the end.